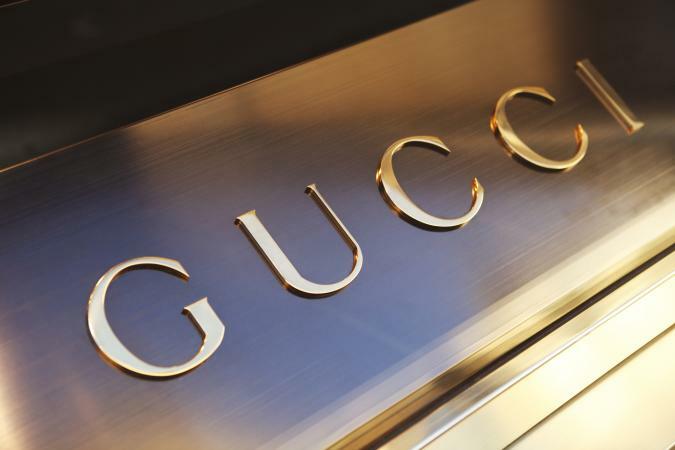 From modest beginnings at the end of the nineteenth century, the Gucci company became one of the world's most successful manufacturers of high-end leather goods, clothing, and other fashion products. As an immigrant in Paris and then London, working in exclusive hotels, young Guccio Gucci (1881-1953) was impressed with the luxurious luggage he saw sophisticated guests bring with them. Upon returning to his birthplace of Florence, a city distinguished for high-quality materials and skilled artisans, he established a shop in 1920 that sold fine leather goods with classic styling. Although Gucci organized his workrooms for industrial methods of production, he maintained traditional aspects of fabrication. Initially Gucci employed skilled workers in basic Florentine leather crafts, attentive to finishing. With expansion, machine stitching was a production method that supported construction. Together with three of his sons, Aldo, Vasco, and Rodolfo, Gucci expanded the company to include stores in Milan and Rome as well as additional shops in Florence. 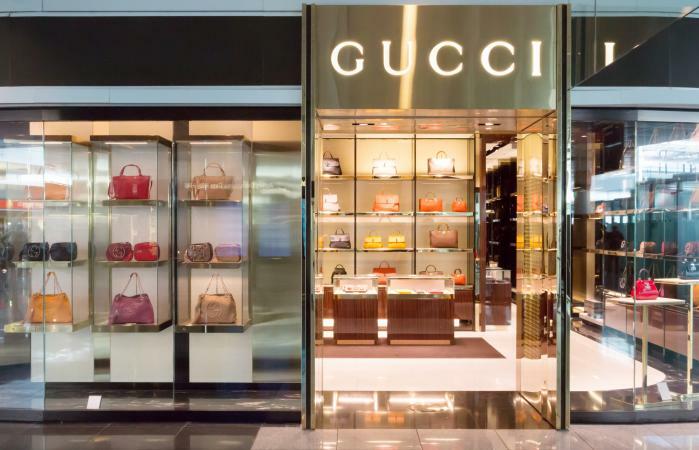 Gucci's stores featured such finely crafted leather accessories as handbags, shoes, and his iconic ornamented loafer as well as silks and knitwear in a signature pattern. The Gucci loafer is the only shoe in the collection of the Museum of Modern Art in New York. Gucci's distinctive lines made its products among the most frequently copied in the world in the early 2000s. Pigskin, calf, and imported exotic animal skins were subjected to various methods of fabrication. Waterproof canvas and satin were used for evening bags. Bamboo was first used to make handbag handles by a process of heating and molding in 1947, and purses made with a shoulder strap and snaffle-bit decoration were introduced in 1960. In 1964 Gucci's lush butterfly pattern was custom-created for silk foulards, followed by equally luxuriant floral patterns. The original Gucci loafer was updated by a distinctive snaffle-bit ornament in 1966, while the "Rolls-Royce" luggage set was introduced in 1970. Watches, jewelry, ties, and eyewear were then added to the company's product lines. A particularly iconic touch, introduced in 1964, was the use of the double-G logo for belt buckles and other accessory decorations. The company prospered through the 1970s, but the 1980s were marked by internal family disputes that brought Gucci to the brink of disaster. Rodolfo's son Maurizio took over the company's direction after his father's death in 1983, and dismissed his uncle Aldo-who eventually served a prison term for tax evasion. Maurizio proved to be an unsuccessful president; he was compelled to sell the family-owned company to Investcorp, a Bahrain-based company, in 1988. Maurizio disposed of his remaining stock in 1993. Tragically, Maurizio was murdered in Milan in 1995, and his former wife, Patrizia Reggiani, was convicted of hiring his killers. Meanwhile, the new investors promoted the American-educated Domenico De Sole from the position of family attorney to president of Gucci America in 1994 and chief executive in 1995. The company had previously brought in Dawn Mello in 1989 as editor and ready-to-wear designer in order to reestablish its reputation. Well aware of Gucci's tarnished image and the value of its name brand, Mello hired Tom Ford in 1990 to design a ready-to-wear line. He was promoted to the position of creative director in 1994. Before Mello returned to her post as president of the American retailer Bergdorf Goodman, she initiated the return of Gucci's headquarters from the business center of Milan to Florence, where its craft traditions were rooted. There she and Ford reduced the number of Gucci products from twenty thousand to a more reasonable five thousand. Tom Ford came to the foundering company with vision and style. Having the strong support of Dominico De Sole, Ford wished to maintain a sense of the company's history while updating Gucci's trademarks. In 1994 Ford became responsible for creative direction, and by 1996 he directed all aspects of the company-including ready-to-wear clothing, visual merchandising, packaging, interior design, and advertising. Ford and De Sole struggled to restore the former reputation of Gucci, while redirecting the growing brand to a new level for the market of the late 1990s. There were seventy-six Gucci stores around the world in 1997, along with numerous licensing agreements. Ford was instrumental in the process of decisionmaking with De Sole when the Gucci Group acquired Yves Saint Laurent Rive Gauche, Bottega Veneta, Boucheron, Sergio Rossi, and, in part-ownership with Stella McCartney, Alexander McQueen and Balenciaga. By 2001 Ford and De Sole shared the responsibility for major business decisions, while Ford concurrently directed design at Yves Saint Laurent as well as at Gucci. The French conglomerate Pinault-Printemps-Redouté, however, gained ownership of 60 percent of the Gucci Group's stock in 2003. Women's Wear Daily then announced the departure of both Domenico De Sole and Tom Ford from the Gucci Group when their contracts expired in April 2004. The last spring collection under the direction of Ford and De Sole was a critical and commercial success. Amid widespread speculation in the fashion press about Ford's heir, the company announced in March 2004 that he would be replaced by a team of younger designers promoted from the ranks of the company's staff. See also Brands and Labels; Tom Ford; Italian Fashion; Leather and Suede; Yves Saint Laurent; Shoes. Bianchino, Gloria, et al., eds. Italian Fashion. Vol. 1, The Origins of High Fashion and Knitwear. Milan: Electa SpA, 1987. Forden, Sara Gay. The House of Gucci: A Sensational Story of Murder, Madness, Glamour, and Greed. New York: William Morrow, 2000. Horyn, Cathy. "Tom Ford Goes Out with a Roar." New York Times, 26 February 2004.